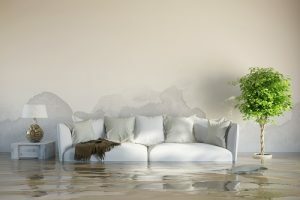 Has your home flooded due to a severe autumn storm? Here are some tips for how to clear up any flood damage in your home. Has your home flooded due to a severe autumn storm? What happened if you had faulty plumbing somewhere in your house – a broken shower, a backed-up toilet, or a defective washing machine, for example? No matter how it happens, floods can cause an astronomical amount of damage to your home. Here are some tips for how to clear up any flood damage in your home. The first step is to dry out any remaining water that you find. Vacuums and sump pumps can assist you with this task. Don’t forget to wear boots if you’re going to be in ankle-deep or higher water, in order to better protect yourself. Also make sure you open all the doors and windows before you begin – this is crucial to proper ventilation. Use fans to send stale air outside. Clean up flooring elements such as carpets and pads. These are unusable once they are soaked with floodwater. If there is anything in the room that got flooded, you might have to dispose of them, no matter what they are: these items could be furniture, bedding, books, keepsakes, and papers. If you see ruined drywall or other forms of insulation, you’ll have to remove these as well. Mold is a lingering problem after any flood, and it is one of the most disgusting and dangerous instances of flood damage. If there is less than ten square feet of mold, you can try to clear it out yourself. Hot water, soap, and bleach should be all you need to clean up and disinfect any affected surfaces. Just remember to never mix bleach with ammonia – you’ll only create a poisonous gas. Wear all the proper protective gear, such as boots, gloves, and face masks while you clean. If anything is too heavily contaminated once you’re done, you’ll need to wash it off with plenty of hot water and strong laundry detergent. This entry was posted on Friday, November 17th, 2017 at 4:33 pm. Both comments and pings are currently closed.